Wednesday, March 30th: Presanctified Liturgy 6:30 p.m., Confession 5:45 p.m.
Friday, April 1st: Akathist (Jesus Christ) 6:30 p.m., Confession 7:0 p.m.
Baptism & Chrismation of Dorcas Soroka 2:00 p.m., Great Vespers 6:30 p.m., Confession 6:00 p.m. Annual Parish Meeting will be held next Sunday, April 3rd following the celebration of the Divine Liturgy. Please mark this date on your calendar of events and plan to attend! Sunday Mission Vespers will be held this afternoon at 4:00 p.m. at All-Saints Orthodox Church in Olyphant, Pennsylvania. Diocesan Clergy will participate. The homilist will be Fr. John Kowalczyk. Heat & Air Collection will be held this morning during the second offering. Please use the special envelopes provided for you on the bulletin table in the vestibule. Monthly Church Committee Meeting will be held this Monday, March 28th at 6:00 p.m. We will be preparing the budget and other items to be presented at the Annual Meeting. Please plan to attend! Adult Education Presentation: “A Deeper Examination of the Teachings of Orthodoxy ” will be held this Wednesday, March 30th, following the celebration of the Presancfited Liturgy. Pot-Luck Lenten Meal will be offered. Please see Matushka Kathy or Millie Telep during Coffee hour and let them know what you will be bringing. 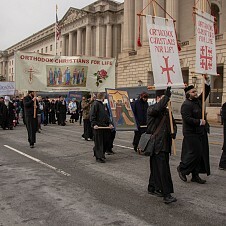 Flower Donations for the Cross of Christ (Mid-Lent) are being accepted for next Sunday. Please see Fr. John or Protodeacon Gabriel during Coffee hour. Memorial & Soul Liturgies will be held on Saturday, April 2nd, and April 9th. Please submit the names of your departed loved ones you want to be commemorated to Fr. John by Friday, April 1st. Please use the memorial form found on the bulletin table in the new addition. 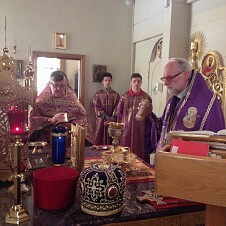 Church School will be held on Sunday, April 3rd, following the Divine Liturgy underneath the Church. Please make every effort to bring your children to Church School. We pray for the speedy recovery of George Kitchura who is a patient at the Geisinger Medical Center in Scranton, Pa., Rm. 466. Hostesses: Sunday, March 27th: Theresa Krenitsky, Irene Kiehart, Mary Mathena; April 3rd: Jean Malec, Barbara Nayduch, Ann Narcoonis; April 10th: Millie Wanas, Marilyn Petorak, Maryann Serafini; April 17th: Karen Wanas, Matushka Dolores Petorak, Mille Telep; April 24th: Dorothy Allen, Debbie Bernosky, and Ann Butler.